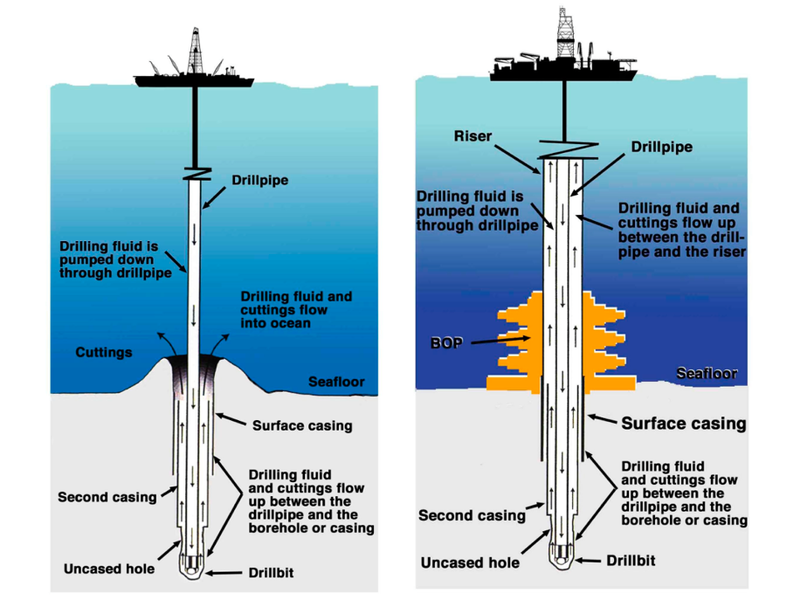 The riser drilling operation by the D/V Chikyu yields cuttings, which are utilized as a source of geological information, especially in the intervals where coring could not be conducted for various reasons. Even in the intervals, where coring could be conducted, cuttings become a source extra information about the geological layers in that interval. Typically, cuttings are collected every 5 to 10 m interval during the riser drilling (Fig. 1). 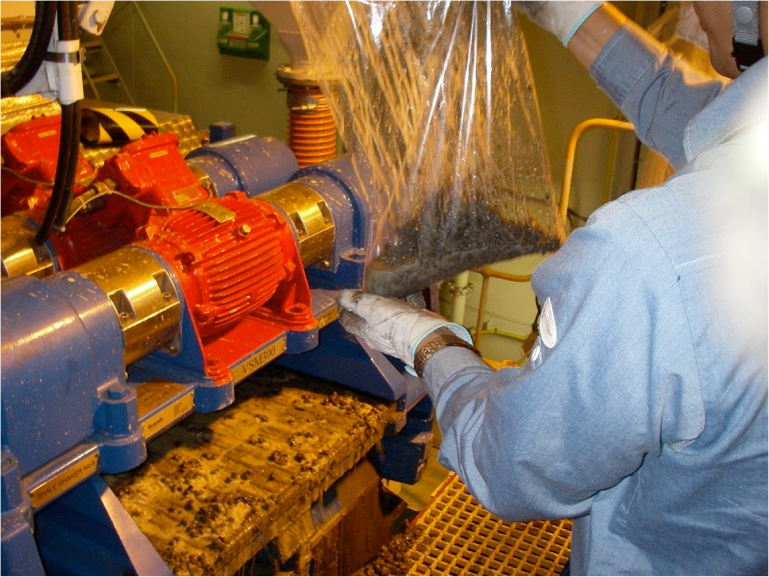 Artificial mud is pumped from the ship to the hole being drilled on the sea floor, and small fragments of rocks from the geological layers around the hole are brought up on the ship by the circulating mud. Shale shaker on the ship separates mud from cuttings partly, and the cuttings are collected in bulk from the shaker (Fig. 2). The cuttings are brought to core cutting area and processed based on the core flow scheme of the expedition (Fig. 3). An example of cuttings flow. It varies slightly in each expedition. 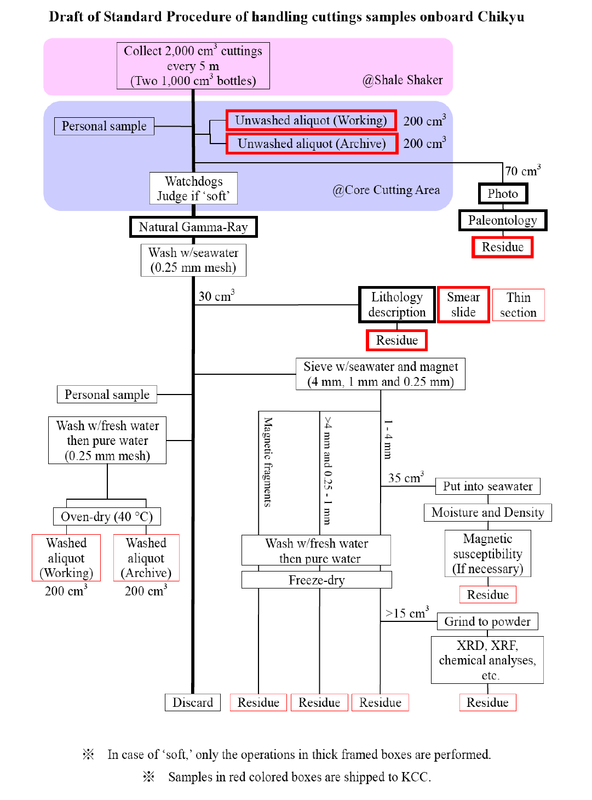 Cuttings are recorded in sample database as SMW (Solid from Mud Water). Each SMW is sequentially numbered from shallow to deeper depth. Besides cuttings, circulating mud is also collected from time to time to study background concentrations of various elements, compounds, etc. used in preparing the mud. 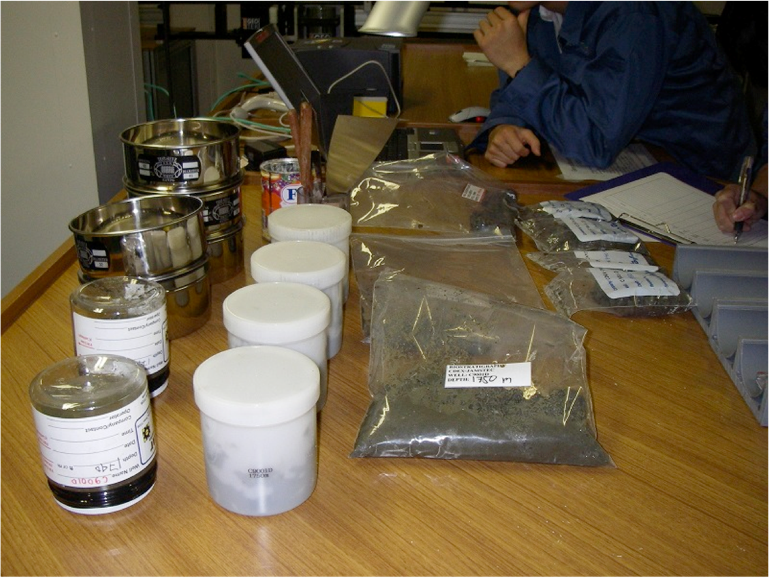 The mud is recorded in the sample database as LMT (Liquid from Mud Tank) or LMW (Liquid from Mud Water).